Prince of Persia: The Sands of Time has been out for a while. I watched it a couple of weeks back. But yesterday, I watched it in all of its high definition glory 720p. It was good, and I thought it deserved a blog post. The movie is based on the video game character of the same name. I did play the earlier games, though not the recent ones, and remember that I had a lot of fun playing them. Hence, I was excited about the movie and expectation was high. The story is different from the games but there are some scenes which will make you smile in recognition. Story goes something like this. Dastan, (Jake Gyllenha) a young street boy is taken under the wing of a gracious King for his bravery and grows up to be adoptive brother to the heirs of Persian throne. 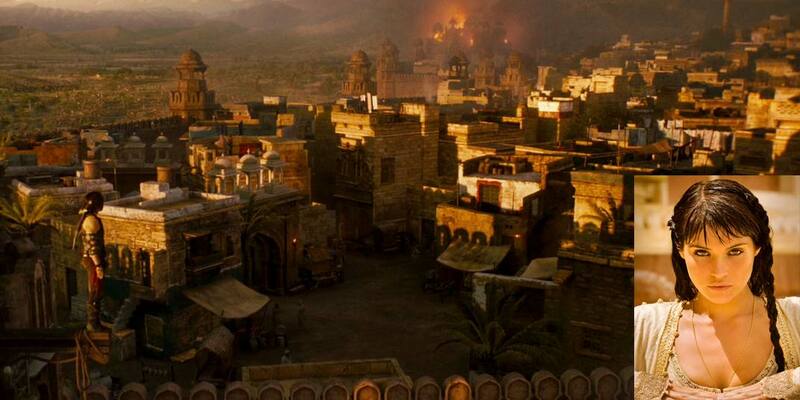 In the King's absence, and ignoring Dastan's objections, the Persian army led by Dastan's brothers and uncle (Ben Kingsley) decides to invade the Holy City of Alamut assuming they are forging and supplying top-grade weapons to the enemies. Unbeknownst to his brothers, Dastan manages to gain access to Alamut and open the gate, hence avoiding a massive confrontation and a bloodbath. While in Alamut, Dastan finds a dagger and keeps it. Here on the events take a turn, and Dastan is blamed for treachery and murder, and flees the scene with Princess of Alamut, Tamina (Gemma Arterton), with the Persian army hot on their trail. The story unfolds that the dagger he kept earlier is filled with Sands of Time, and is capable of transporting the bearer back in time, to change things in his favor and Princess Tamina is it's guardian. Dastan decides to go back to Alamut to learn the truth and clear his name. Tamina has her own agenda and wants the dagger back but agrees to go with him. They meet and make alliance with a reluctant shiekh (Alfred Molina) who claims to be a "slightly dishonest entrepreneur". Being a big budget summer movie it provides entertaining characters, intense action scenes, and good eye-candy visuals. Some of the scenes were a bit overwhelming for me. Zipping along rooftops, putting modern urban parkour artists to shame. Missing arrows whizzing past by inches. Amazing rope swinging accuracy with impossible acrobatics and doing backflips to a safe doorway when the whole place is crumbling down. But I liked the few slow motion shots, they did not feel obvious or redundant. Nice. Once you get in to the movie it is as pleasing as any other movie of the ilk. You can sit back and enjoy this movie and forget about it. It is entertaining and just as easily dismissible. Also, the movie finally manages to give the Prince a name, Dastan, which all the games past failed to do. I do not like that name. Gemma Arterton was beautiful and sensuous. She definitely looked the part of a Princess. I could not help wonder the parallels the story takes to the actual events that has transpired in our recent history. America invading Iran (then Persia) in the guise that Iran had weapons of mass destruction. They never did find any. The movie wasn't that bad. Jake Gyllenhaal does not fit the character of a guy running on rooftops and doing all those fight scenes. But the hotness of Gemma Arterton made watching the movie worthwhile. Gemma Arterton was nothing but eye candy! I loved the movie, but her acting wasn't that good compared to the rest of the movie, she was a bit fake, the dialogues and all, but yeah she looked like a princess and I agree with the hotness! just the reading dialogue fakeness. hehe. It is refreshing to see a change in your writing style. And I should add your words are easy to read and follow; something that is not easily achieved. As for the movie, I have yet to see it. Jake Gyllenha was effing hot! I really liked this movie. And it was the first movie I've seen of Gemma Arterton. Oh and during the ending when she fell I thought oh noooo! But when time was turned and it was all a happy ending I was happy too haha. We could at least use a happy ending in movies when we can't have em in reality. if your GF/BF dies ... and you could turn back time ... what would you do ??? the movie is based off of the prince of Persia sands of time video game that came out for the ps2 .. also worth noting is that its by far one of the best movies based on a video game.. that "Almost" got it right.